A prominent feature of the Watercolor community is the Watercolor Inn. Northwest Florida’s Only Four Diamond AAA Hotel, was recognized with a World’s Best – Travel + Leisure Award and Travel + Leisure – Top 50 Resorts in the US/Canada. Watercolor Florida was also listed as a Fodor’ Choice for 2010. 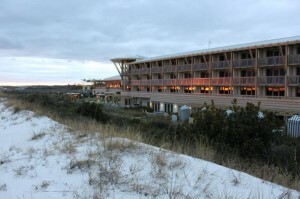 The Inn was designed by acclaimed restaurant designer, David Rockwell. The Inn captures the essence of a tranquil getaway. The perfect combination of Florida family resort, warm Southern hospitality, the intimacy of a bed and breakfast, and the fun of a classic beach house, the Watercolor Inn & Resort creates the ideal setting to relax—and to play. Maybe that’s why families have been visiting our Inn & Resort year after year. We invite you to visit our beautiful property, and start a tradition of your very own. WaterColor’s flagship restaurant is Fish out of Water, one of Scenic 30-A’s only restaurants overlooking the Gulf of Mexico. The restaurant features fresh seafood prepared with a unique flair and boasts an extensive wine list, Sushi Bar, exhibition kitchen, private wine room dining among international vintages, and other artful touches. If you are looking for a little more casual, then Chans Wine Market is a great place to kick back, enjoy a glass of wine and listen to live music. WaterColor and WaterColor Inn guests enjoy access to a variety of diversions situated throughout the 499-acre community. Western Lake, a rare, 220-acre coastal dune lake bordered by coastal pine forests, is among them. The Boathouse outfits Yolo Boarding, canoeing, kayaking, and sailing excursions. There are 5 swimming pools, one which is adult only, tennis, biking and hiking trails, a kids day camp and an intimate spa. 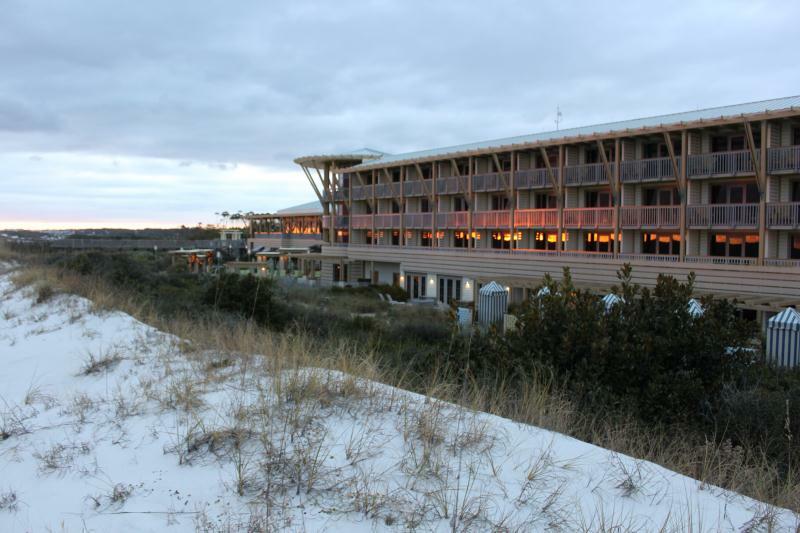 Watercolor’s Gulf-front Beach Club has great views, waterside activities, and sunsets. The private WaterColor Beach Club is an oasis from too much sun and a good place to enjoy good food and drinks. The Beach club has fully-equipped changing rooms with showers and lockers and a pool service area that offers sun screen products, sunglasses, hats and water toys. Adjacent to the Beach Club is the Watercolor Workout Facility , a full-service exercise gym. Cerulean Park, a Beautiful park linking gulf to lake, is WaterColor’s central gathering space and Town Center . Hiking and biking paths unfold in an extensive woodland trail system within WaterColor. Nearby state parks offer additional hiking and biking trails with a variety of wildlife.